You are here: Home / New to Podcasts? Once upon a time, the closest we could get to listening to spies was to try tuning in to a mysterious number station or to hopefully catch a documentary. Or we might get the chance to hear our favorite author being interviewed. All that changed in 2017 with the launch of Spybrary, a podcast for spy fans by spy fans. Yet inquiring agents may be new to listening to podcasts so here our analysts will try to answer your questions with this simple briefing. A podcast, simply put, is the downloadable equivalent of a radio show. Instead of having to set your radio to a certain station, worry about static, or rushing back to your safe house at 6pm precisely, you can listen to a podcast at your leisure. Podcasts can be produced by an agent anywhere in the world armed with a microphone, a computer, a piece of software, and assorted gadgetry readily obtainable from Q-Branch and uploaded onto the internet for listening later. The best part is they are FREE. No need to worry about raiding the reptile fund for a rendezvous or getting the lamplighters to hook you up. Simply enjoy your download on your desktop, laptop, iPod, smart phone, or shoe phone. Plus there’s no need to worry about tapes that will explode in five seconds or having to sit inside the Cone of Silence. These are among the most frequent references reported by agents in the field. To get episodes onto the device of your choice, there are a variety of options. Here we will mention some of the most prevalent ways of obtaining them. The best known source for podcasts (indeed its in their name) is Apple’s iTunes. If you have an iPhone then you merely have to pick up your phone, download the the “podcasts” app from the App Store, and search for Spybrary. If you are using a desktop or laptop, you’ll download iTunes free from the Apple website. Once installed, simply click on the store, and type Spybrary into the search bar. You can use your smartphone to listen to podcast. Apple has hard coded its podcast app onto your phone, even Q can’t take it off. Its simple, just open the app and search ‘Spybrary’. You might not trust iTunes and want to receive your podcast from a different source, especially if you have an Android phone. Or perhaps you have an iPhone and want to trust this second source anyway. To use this alternative source, go to the App store on your phone, download the Stitcher app, and search for Spybrary. 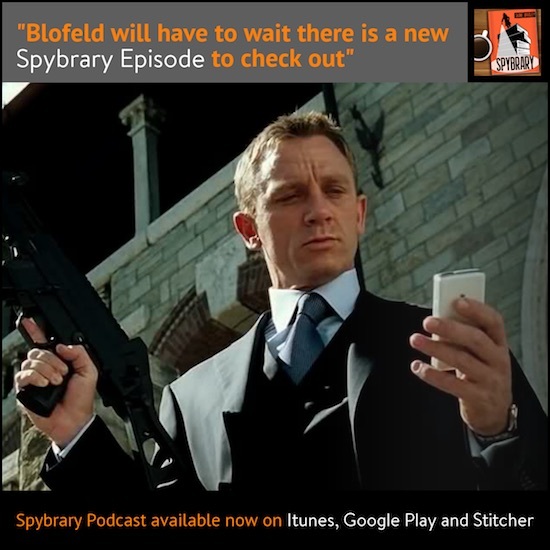 If you listen to music on your smartphone in between dead drops then did you know that you can also listen to the Spybrary Spy Podcast? Just search ‘Spybrary’. Easy. Perhaps you don’t wish to venture out of the Circus to listen? You can listen to them right here on the site. There are two ways you can do this. The first is to click “Podcast Episodes” from the menu at the top of the page which will take you to a page which lists the episodes, starting with the latest release and go back all the way to the beginning of the operation. Just click the play button on the episode of your choice and you can listen to Spybrary on your computer. Looking for something specific? You can use the search bar in the top right hand corner and enter what you’re looking for be it “le Carre”, “The Prisoner”, or something else entirely. If you’re search turns up the episode you’re looking for, click on that episode and you’ll see a “Listen To Spybrary” box towards the top of the page. Press the play button and the episode will start playing. If you’re trusted source is iTunes or Stitcher, you have the option to subscribe to the podcast. Like a good agent leaving a dead drop, this will leave valuable episodes for you to listen to. The benefits are that you will access to the latest Spybrary episode without having to seek it out, making it all the easier for you to listen. It also helps Spybrary to rise through the ranks (as does leaving a review on the podcast’s page if you’re so inclined). This will help bring it to the attention of more spybrarians the world over. Episodes of Spybrary are released approximately every two weeks. These include interviews with authors, historians, intelligence experts, and spy fans. The latter can submit reports known by the operational name “Brush Pass” to report on spy books, movies, and TV shows they have just finished reading/watching. Such “Brush Pass” operations to be short duration, less than ten minutes in length on average. Spies and Shadows TV – The Sunday Spy Show with Brian Gray.